At this month’s Third Thursday Thrive meeting we enjoyed a show-and-tell by one of the world’s leading beachcombing experts, Deacon Ritterbush, also known as ‘Dr. Beachcomb.’ She’s a knowledgeable, down-to-earth woman and scholar who relates what she sees on the beach to the history of the area and the people who lived there. The focus of this night was mostly the Hāmākua coast and the Asian and Portuguese immigrants brought here to work on the sugar plantations. Picture courtesy of Dr. Beachcomb. 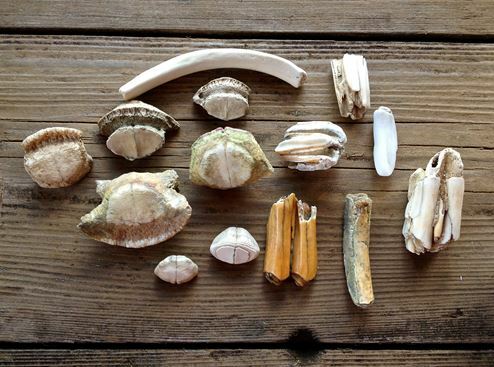 A note about beachcombing in Hawai‘i: we have a law that makes it illegal to take an artifact of the precontact Native Hawaiians, whether it is found on a mountain or a beach ‒ nada. But anything else is fair game. To ground us, Deacon started by talking about marine artifacts. 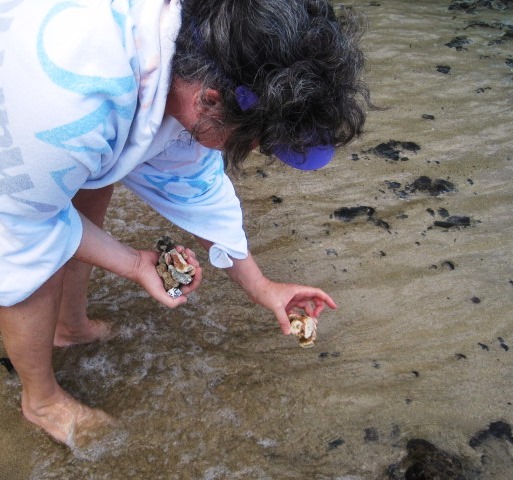 Ever the good eco-steward, she reminded us not to take live animals out of the sea and kill them for their shells. In fact, we might want to boycott shell merchants because it’s likely that their shells come from the Philippines or Indonesia where people dive for shelled animals and coral to sell to American shops. That practice is not sustainable: at the rate they are depleting their waters, soon they won’t have these creatures anymore. Besides, it’s better to make your own memories and collect the empty shells yourself on the beach, rather than buy them. Photo by Dr. Beachcomb. Bones and teeth on the left and top. Then she began to focus on artifacts that speak of post-outsider contact on these islands. She showed us black glass, old pottery shards, cow teeth and animal bones she’d found along Kona-side beaches. Captain George Vancouver brought the first cattle to the Big Island as a gift for King Kamehameha in 1783 and 1794. I had no idea that a cow’s tooth was so large. 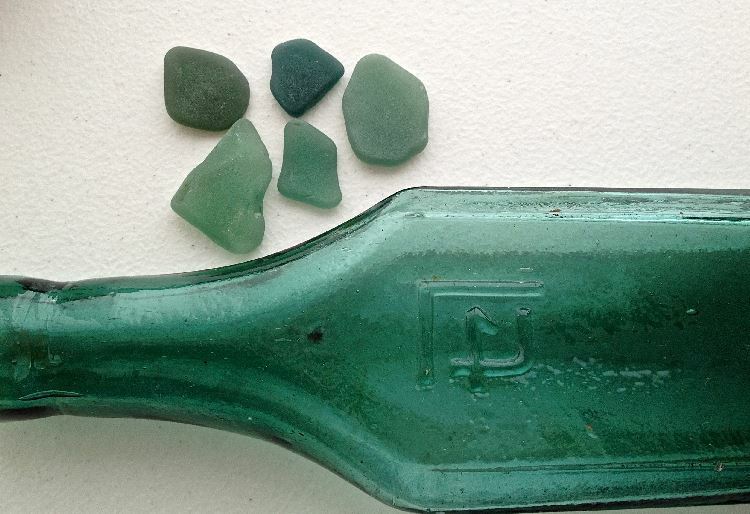 We found her manmade beach-finds fascinating for the stories they told, including old bottles. It was the custom to dump old bottles and trash along rivers (on Hawai‘i’s Hāmākua Coast, mostly down at the bottom of the gulches), and to toss emptied drink bottles off ferries or ships that came into and out of our ports. She told us of a neat little shop in Honomu near Akaka Falls that sells these old bottles. Some are teal saki bottles and nori jars used by Japanese immigrants. Blue medicine bottles were also abundant. By looking at the bottles, it is easy to understand the color of the sea glass that you can find on the Hāmākua Coast. Glass shards from white ceramic jars also wash ashore. These are from the cold cream, liniment and pomade jars used by sugar plantation workers. They’d come in from being in the sun all day and wipe the cold cream or ointment on their burning skin. The young Filipino men apparently favored pomade to shape their hair before going out for the weekend, perhaps a movie at the Honoka’a People’s Theatre. Deacon also showed us shards of lavender or amethyst sea glass. In the old days, glass manufacturers didn’t know how to make clear glass, so they’d add manganese to the mix as a clearing agent. Over time in the sun, the manganese turned the glass purple. 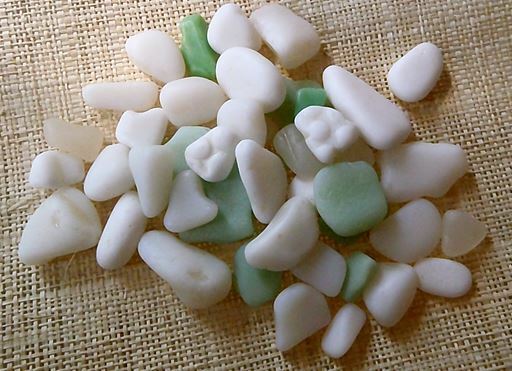 There’s a big market for sea glass, and merchants can get up to $40 for a nice piece. But again, she suggested it’s best to steer clear of shell shops, as the Chinese are flooding the market with artificial sea glass. She showed us samples, and while she can tell the difference, to my unpracticed eye, they looked similar to the real thing. Again, make your own memories by finding the sea glass yourself, because it’s the context in which you find something that you will remember and savor. 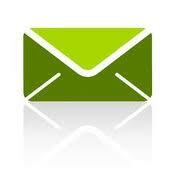 You can explore Dr. Beachcomb’s website at: www.drbeachcomb.com. She even sponsors a yearly beachcombing conference. How cool would that be! For more info see www.beachcombingconference.com. Deacon inspired me so much that I invited Julia to go to the beach the very next morning at a beach I hadn’t visited before, Kona-side. I’ve steered clear of it because it doesn’t have lifeguards, and I have to set a good example for my girls. But Julia assured me that the beach was safe and a shallow walk out. And of course being summer, the waves were gentle. 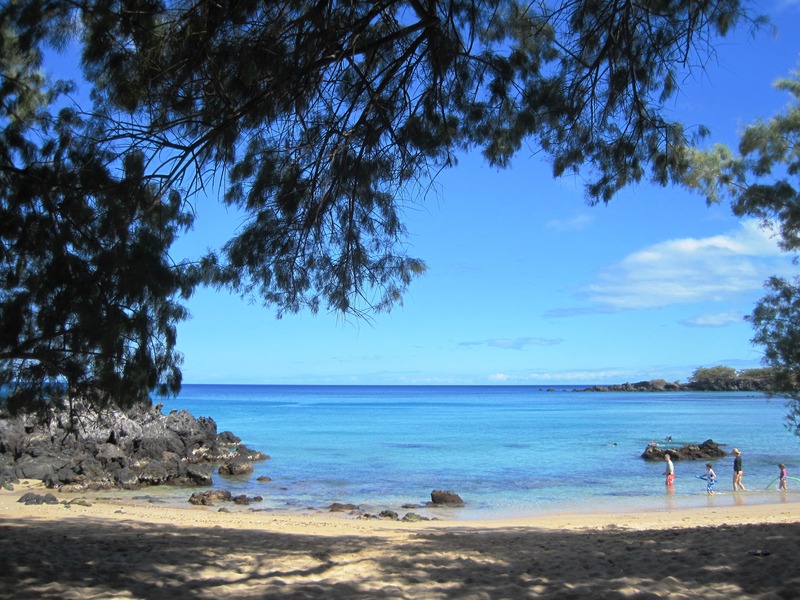 The really cool thing (literally) about this beach is that it is narrower than Hapuna, bringing shade nearly down to the water’s edge so sand and people stay cooler. The water contains a band of coral reef, but there’s clear swimming in front of and behind it, with a channel that allows swimmers to get to the back side and avoid it entirely. Julia says that snorkeling is amazing near the coral: many fish, and of course the coral itself is beautiful. That will have to be for next time, since we didn’t bring our snorkeling gear. 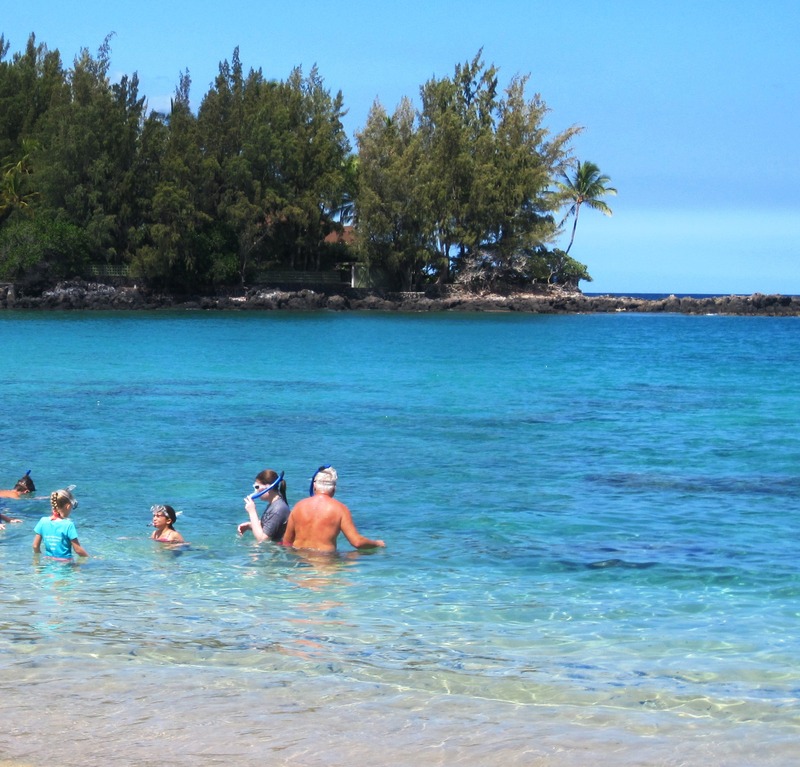 But we did see many families snorkeling and even a family learning to snorkel from a teacher. The water was warm by Lake Michigan standards – the swimming hole of my youth in Wisconsin. After a leisurely swim (I call it ocean bobbing), we dried off and walked the entire length of the beach, applying the new skills we learned the night before. My Lake Michigan beachcombing primed me for pretty rocks, and my Florida vacations prepared me for shells, neither of which were in abundance. The Big Island is too new and steep to have many shelled animals. The sand is made from coral and lava, so we found pieces of those, rounded from tumbling in the surf. I also found two small pieces of brown sea glass. It was an amateur’s start, but I was happy with my treasures. We didn’t expect to find the kind of artifacts Deacon had talked about the night before because we were not on the plantation side of the island. That’s the Hāmākua Coast where it’s difficult to get down to the beach because that coast is mostly cliffs. But there must be some entry spots, and I’ll try to find them at some point. One tip: avoid the glistening pink-orange stuff on the beach. It turned out to be a soft piece of used gum. Ack! 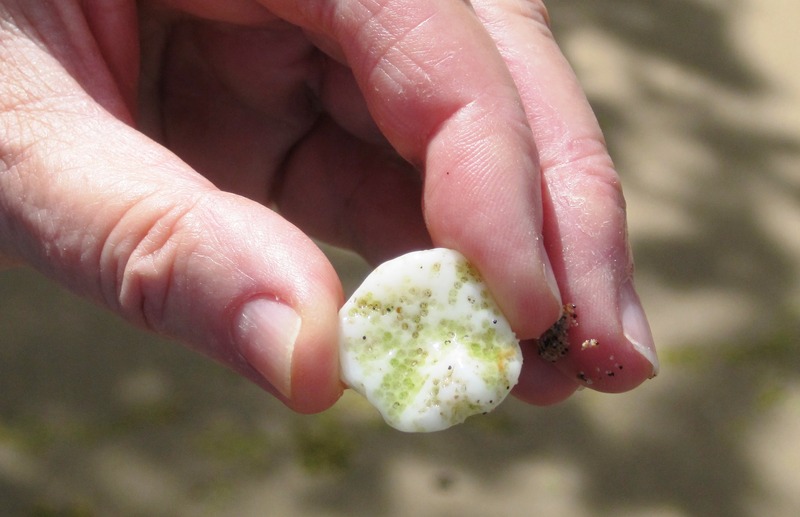 See also Glassy angular sea surges: sea-glass (#2 of 3 essays on HI beachcombing) and I solemnly swear to enjoy the beach (#3 of 3 essays on HI beachcombing) and Beachcombing with Dr. Beachcomb. This entry was posted in beachcombing, Coral, Hamakua, Hawaii beaches, lava, Plantation era, sustainability and tagged Dr. Beachcomb, Glass from the Past Shop in Honomu, Hāmākua coast beachcombing, Third Thursday Thrive. Bookmark the permalink. Fascinating…thank you for the walk on the beach with new eyes. What a rich experience you are having!